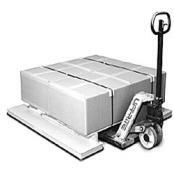 At Central Carolina Scale, we have several very good sets of weigh beams for sale. 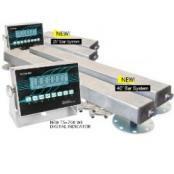 The AWB-5K Weigh Bars and AWB40-5K Weigh Bars Set of (2) load bars calibrated with digital weight indicator. These are probably the finest in the industry both in performance and quality. It includes 2 complete weigh bars, 2 quick disconnect cables, and one stainless steel indicator with internal battery. 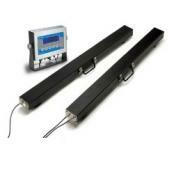 These weigh bars are virtually watertight with sealing at the end of the bar as well as the feet. There are quick disconnect steel braided cables on both ends to make service a snap. These cattle scales have feet that are 6 1/4", galvanized, and can be mounted (if the customer desires) with cement bolts provided. We have been recommending and selling weigh bars for years and have finally designed what many feel are the very best available. 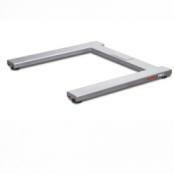 We chose to include a couple of "u" shape or horseshoe shape floor scales in our Weigh Beams section. These are not nearly as portable as the other sets of weigh bars but they are just similar enough that we felt obligated to at least introduce you to this style of industrial floor scale as well. If you're looking for a portable set of scales, then the weigh beams are probably a good choice. However, if you're looking for a permanent solution, then you might want to consider the horseshoe shaped platform scale system, which would be ideal for long term use.